Policy makers need to focus on the Middle East and North Africa’s three big crises. The beginnings of land reform in Egypt, 1956. JP /Press Association. All rights reserved.As the UNHC reports this week that over 10,000 migrants have been killed crossing the Mediterranean Sea to Europe since 2014, it is clear that we are only at the start of the problem for Europe. While war, the spread of Islamism and the collapse of states such as Libya are rightly blamed as the key factors behind the mass movement of people from North Africa and the Mediterranean, aid agencies now accept that some of these young men are on the road because of the discreet and mostly unreported results of climate change. Walking down a food line on the Greek island of Lesbos during the winter, I was astounded to find young men from Sub-Saharan Africa and as far in the east as Bangladesh. Among them were two agricultural workers from Iran, which struck me as odd because I hadn’t associated their country with the sort of crises that explained the presence of the others in the line. But once you know about Iran’s climate, it isn’t so surprising. There have been only three years in the last 25 when the country did not record a decline in rainfall. The shortfall has usually been met by using groundwater, but this is drying up. Iran has used 70 percent of its supplies of groundwater in the last 50 years, which means it will have very little to fall back on over the next 20 years. 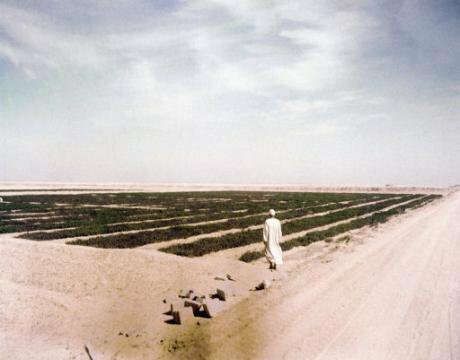 In the south east of the country, for example, a landscape that was once green with pistachio groves is rapidly becoming barren because the aquifers are running dry. About 15 percent of the pistachio groves in the area have died in the last ten years, and there is absolutely no hope of reversal in that trend. Quite simply, the water has gone and rains will never replace it. This may not seem especially newsworthy but the sudden collapse of a particular crop like this is precisely the sort of climate change impact that we can expect to see across the Middle East and North Africa over the next 20 - 30 years, robbing people of jobs and forcing them to find a living elsewhere. A recent report by the Max Planck Institute for Chemistry found that with only an increase of 1.5-2.0 degrees – the increase agreed at the Paris Climate Change summit last year – the Middle East and North Africa (MENA) is likely to become disproportionately hotter, with summer temperatures increasing more than two times faster than the average pace of global warming. “In future, the climate in large parts of the Middle East and North Africa could change in such a manner that the very existence of its inhabitants is in jeopardy,” Professor Johannes Lelieveld, director at the Max Planck Institute for Chemistry, said last month on the launch of his report. He went on to say that prolonged heat waves, with 200 unusually hot days per year, together with associated desert dust storms are likely to render some regions uninhabitable. So, it’s not just a question of loss of work, which is anyway scarce in the MENA countries, it will be well nigh impossible to live there, and that means people will begin to move north in large numbers. Ayztim, an ecological think-tank in Israel, suggests that by the end of the century there will be severe water shortages and a lot more desertification and loss of arable land, and that these will first show in intense competition for water of the Jordan and Yarmouk Rivers, which are currently the subject of agreements. There may well be occasions on which individual states choose to go to war to control new water supplies, or to guard their own. This is to say little about the reduced levels of aquifers all over the Middle East and the risk of saline contamination in coastal aquifers. Obviously, we can’t predict the order or the severity of events across the region, but the pressure on water and the changes in climate are realities now, not the fictions of climate scientists seeking to fund their pet projects. When climate change is placed alongside the population growth in the region, the scale of the problem comes into focus and you begin to see the migrations of the last two years in a different light. In less than 20 years, the population of the Middle East has grown by 108 million – 44 percent, a rate higher than India (34 percent) or China (17 percent). For example, Palestine recorded a rise of 106 percent in the same period. The story is much the same across North Africa: Egypt’s population rose from 57 million in 1990 to 81 million in 2008 – a 40 percent increase. There is one other important fact that he did not mention – the decline in marriage across the region, which in the restrictive MENA societies means many young men have no hope of having normal sexual relations. Little more than a decade ago, about 60 percent of Middle Eastern men married by their late twenties. Today, the figure is just over 50 percent, and Iran it is 38 percent. There is a new generation of young men who cannot afford to marry, have no work, cannot leave home and are sexually frustrated. The traditional passage to adult life, its responsibilities and joys, is barred to them. Little wonder, therefore, that I found two extremely polite Iranian lads in the food queue on Lesbos, hoping somehow to enter the EU’s Schengen area to find themselves a life that is already impossible in their home country. When the effects of climate change begin to really tell on agriculture and water resources, they are likely to be followed by far more young men, and maybe they won’t be quite so polite. Despite the vast toll on the waters of the Mediterranean Sea, Europeans still mostly believe that these are all external problems that have nothing to do with us. But in the decades to come, Europe will come to realize that what we saw in the movement of over one million people between 2014 - 2016, together with the death toll of 10,000, was the overture to a much bigger migration. Policy makers, politicians and societies now need to recognise that this is our problem, and we ignore it at our peril. This piece was originally published in Inker magazine on June 11, 2016. Inker magazine was founded by the novelist and journalist Henry Porter in the spring of 2016 with the help of Casey Larsen. Inker is independently owned and has no investors to answer to. We accept outside contributions and will begin to offer book serialisations in the first year’s operation. Journalistically, we will publish what we believe to be right and true. Inker has few fixed ideas about current affairs, other than believing in the probable wisdom of the UK remaining in the European Union. Our main object will be to report on and think about the present political turbulence in western societies, but we will carry much lighter material, too. To some extent, we will be finding our way, so contact us with your ideas and views. It will be good to hear from you. That’s it. H.P.